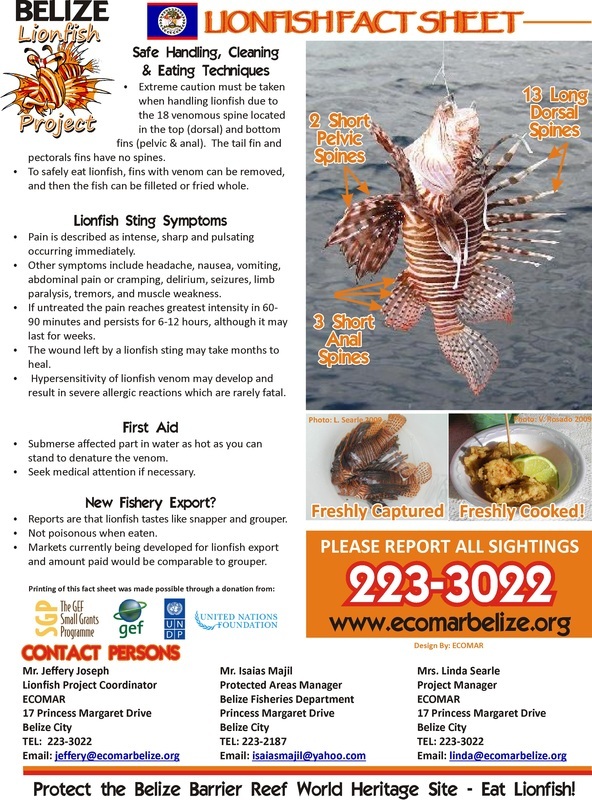 ECOMAR has monitored the the spread of lionfish in Belize since they were first observed in Dec 2008. Their numbers quickly increased and within 8 months they were entrenched in our marine ecosystems and could be found in most mangroves, seagrass beds and coral reefs. Today ECOMAR continues to promote Catch & Fillet! Poster launched in 2008 after first lionfish was observed off Calabash Caye, Turneffe Atoll. In December 2008 ECOMAR launched the Belize Lionfish Program in association with the Belize Fisheries Department when the first documented lionfish was observed and photographed east of Calabash Caye at Turneffe Atoll. 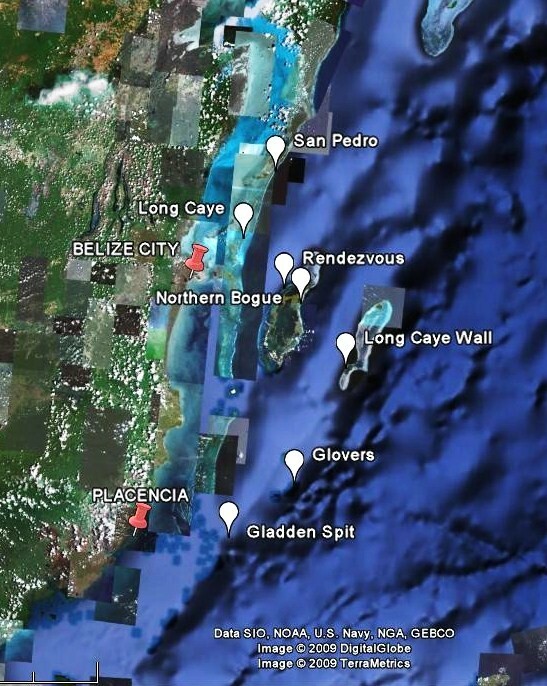 Locations where lionfish were reported in Belize as of June 2009. 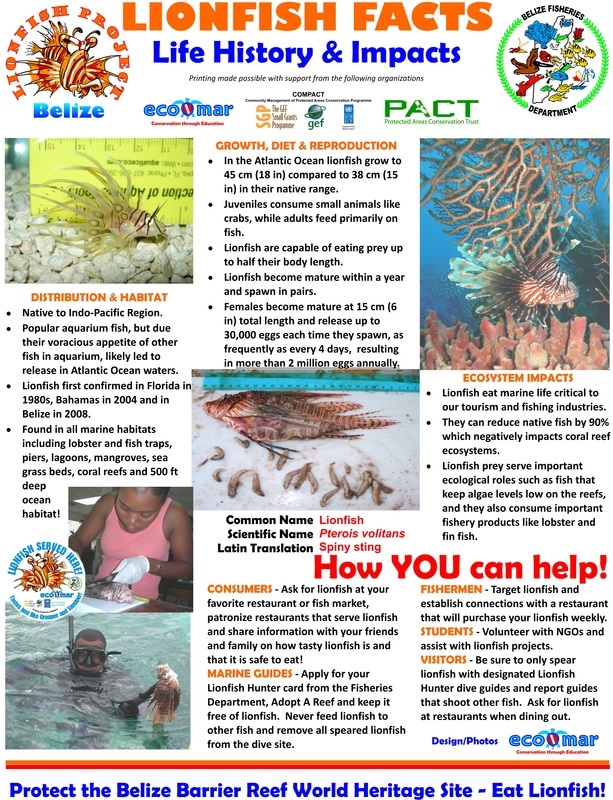 In partnership with the Belize Fisheries Department ECOMAR began educating stakeholders by distributing Lionfish Toolkits that included posters, dip nets and fact sheets to resorts on the atolls where the lionfish were being observed. Throughout 2009 the numbers of lionfish reported in Belize waters steadily increased. In the early 2009 lionfish were observed most frequently on the three atolls, Turneffe, Lighthouse and Glovers, and near Ambergris Caye, but by the end of 2009 lionfish were being observed all along the length of the Belize Barrier Reef. To lessen the impact lionfish are expected to have on the marine ecosystem, ECOMAR and other members of the Belize National Coral Reef Monitoring Network have formed the Lionfish Committee to define, discuss and identify actions that could be taken to manage the invasive lionfish in Belize waters. ECOMAR, members of the Lionfish Committee, the Belize Fisheries Department and representatives from the fishing cooperatives and tour guide associations collaborate to develop the Belize Lionfish Fishery Management Plan. 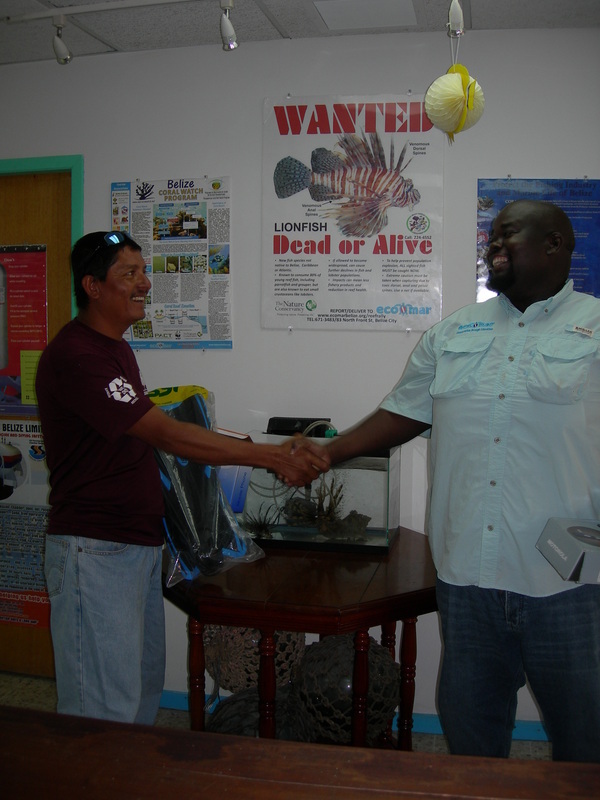 Rudy Duran, from Island Divers,was the overall winner of the monthly lionfish tournament marine guide category, and received an underwater camera as the grand prize. Lionfish are observed near piers, over seagrass beds, among mangrove prop roots, on coral reefs from 5 to 170 feet deep, and even from 500 deep where they have been captured on baited hooks. Interestingly, their numbers are low in the Port Honduras Marine Reserve, which is located in the southern part of Belize along the mainland coast. The increasing numbers of invasive lionfish in the Belize Barrier Reef World Heritage Site and associated reef systems are expected to cause additional negative impacts on an already stressed ecosystem affected by overfishing, coral bleaching and ocean acidification. In February 2010 ECOMAR was the recipient of one of three grants administered by the Gulf & Caribbean Fisheries Institute (GCFI) Small Grants Fund (SGF), which is funded by the United National Environment Program (UNEP), United Nations Caribbean Environment Program (UNCEP), and the Community Management of Marine Protected Areas Network (CAMPAM). The project funded was titled The Belize Bahamas Fishermen Exchange: Lionfish Management Workshop. Six persons traveled from Belize to the Bahamas to learn first hand what the Bahamas was doing to manage lionfish and to interact with the fishermen that were capturing lionfish. Four representatives went from the fishing coops, one person from the Belize Fisheries Department, and a representative from ECOMAR. The valuable lessons learned were shared with colleagues upon returning to Belize. garner renewed enthusiasm and interest in protecting the Belize Barrier Reef Reserve System and the associated marine areas. 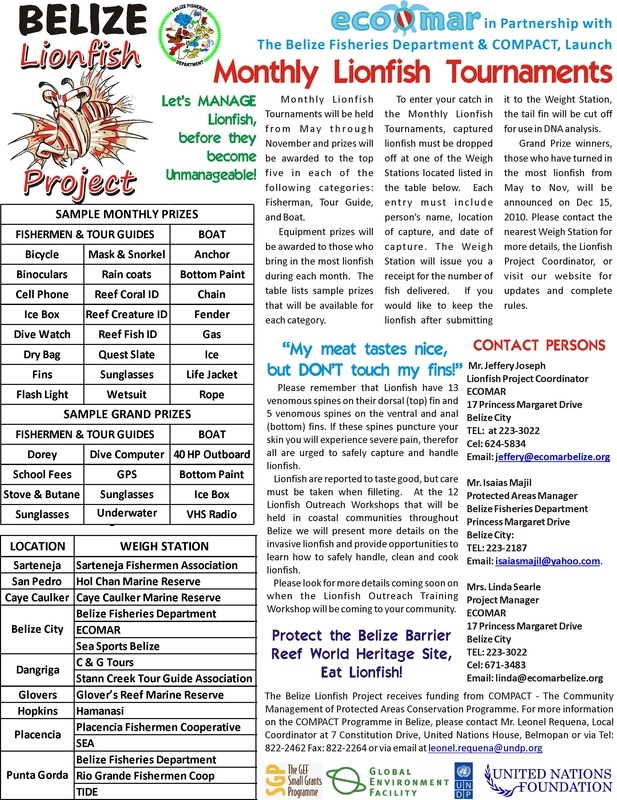 encourage the general public that lionfish are safe to eat. 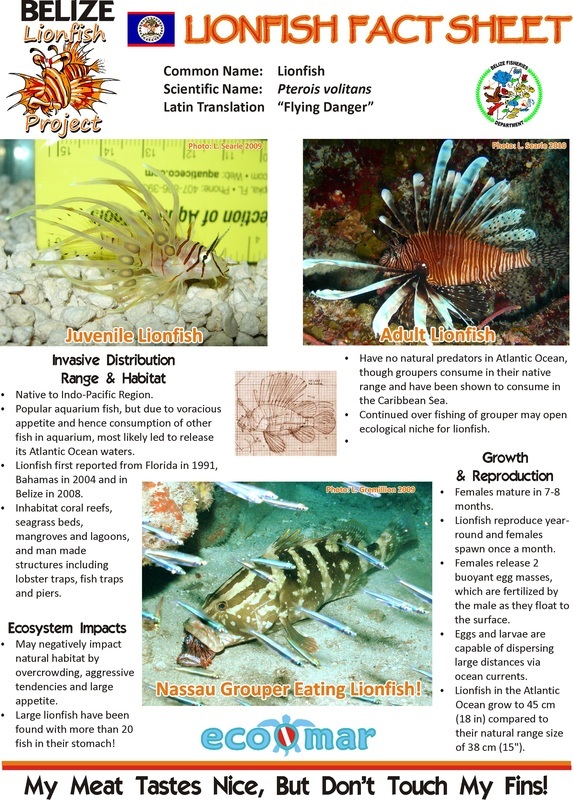 inform the coastal fishing communities and general public the impacts the invasive lionfish may have on the livelihoods of those who rely on a healthy coral reef ecosystem. 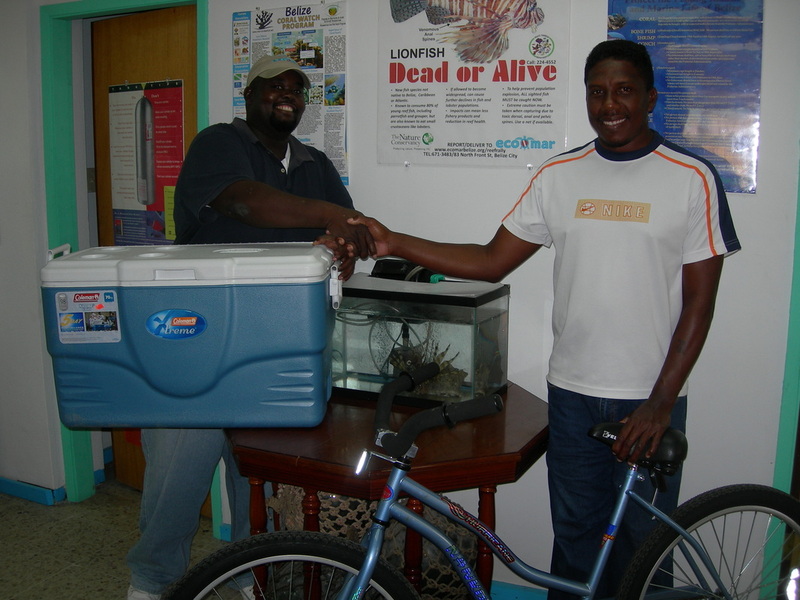 Fisherman of the monthly lionfish tournaments claims his prize of an icebox and bicycle! 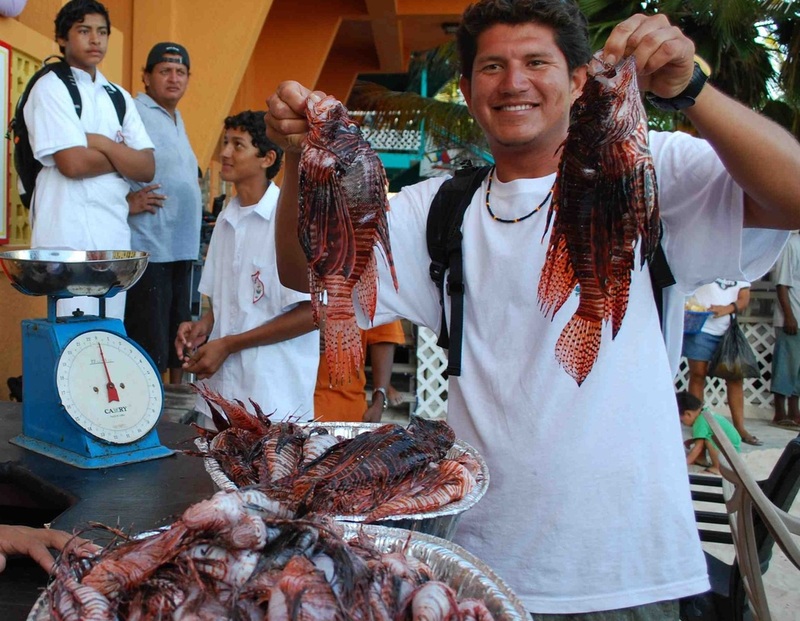 Scuba instructor Nefali Lemus proudly displays his catch in the San Pedro Lionfish Tournament! While it was initially thought that a rapid proactive response to encourage fishermen and marine guides to capture all lionfish sighted could possibly play a crucial role in controlling and managing the impact of lionfish in Belize, the increase in numbers and extent of coverage suggested that the only way to control lionfish populations is for divers, resorts and fishermen to Adopt A Reef and keep this area clean of lionfish. Stakeholders in Belize are working together to manage lionfish. Marine guides are dedicated to keeping their numbers low on the dive sites they frequent by removing and eating their catch. Dive shop owners and visitors to Belize support marine guides management efforts. Our secret weapon, the fishermen from Sarteneja, Chunox and Copperbank, are eager to assist in managing lionfish since it will provide them an alternative fishery product to earn a livelihood from. The public and visitors to Belize patronize restaurants that serve lionfish, and request it at those that don't. Government departments issue special Lionfish Hunter permits for scuba divers to use lionfish culling devices. 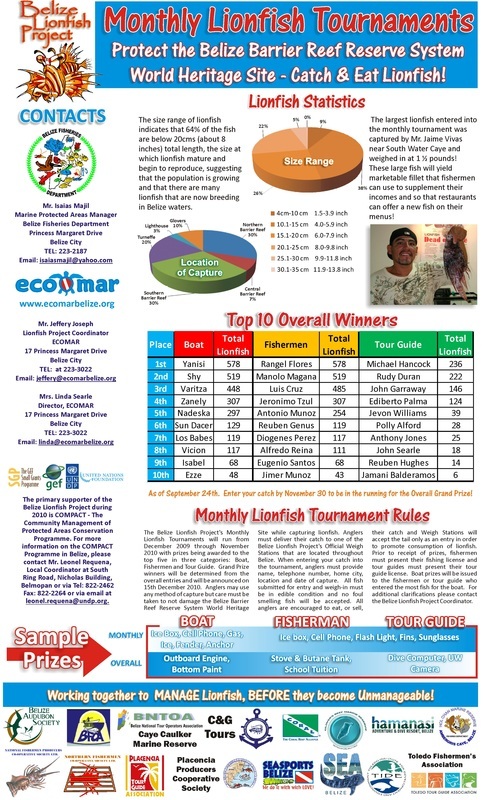 Marine protected area managers coordinate lionfish tournaments in the no take zone of marine protected areas. The public is becoming more aware of the need to conserve the Belize Barrier Reef Reserve System World Heritage Site. launch the mini-documentary titled: The Belize Lionfish Project: A Local Response to a Regional Problem. 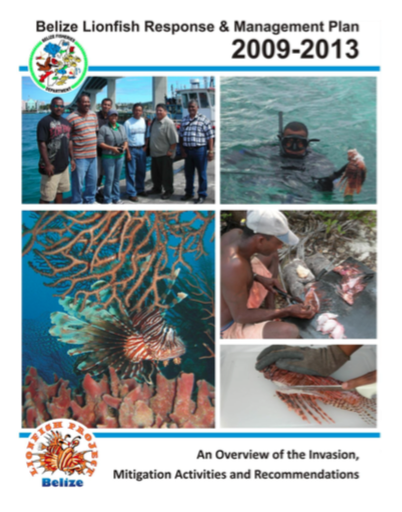 Belize Lionfish Response & Management Plan 2009-2013 printed and distributed to stakeholders. 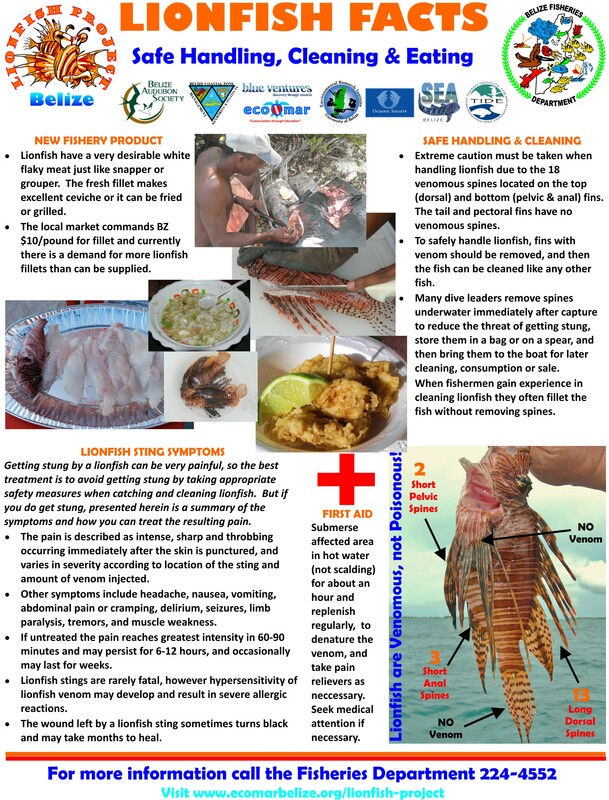 Updated Lionfish Fact Sheets and poster promoting lionfish consumption printed in collaboration with Belize Fisheries Department and other partners from the Belize Coral Reef Monitoring Network which support from PACT. In collaboration with the Belize Fisheries Department ECOMAR collected lionfish for NOVA Southeastern University Oceanographic Center Master's student studying lionfish parasites. Capture of lionfish for consumption is always promoted. Annual events like Reef Week include lionfish competitions which remove lionfish and promote consumption. 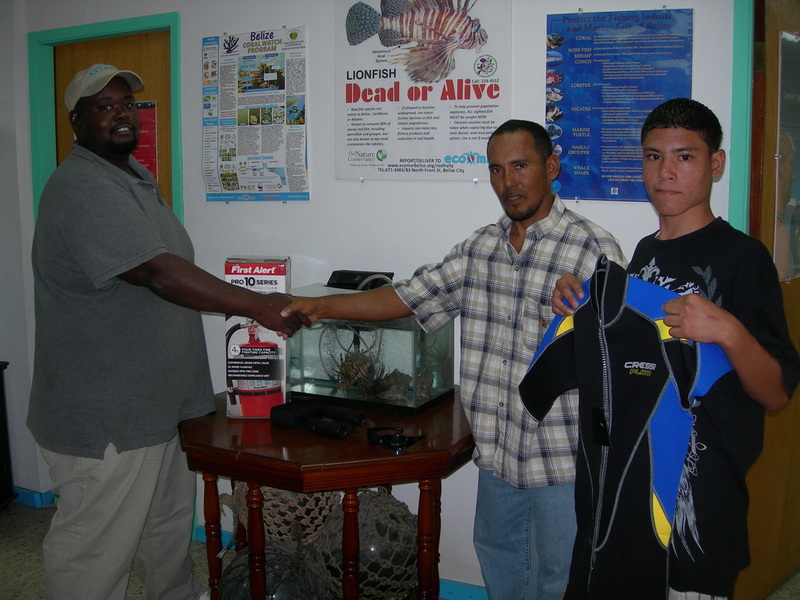 ECOMAR partners with Sea Sports Belize to receive entries from fishermen and marine guides. 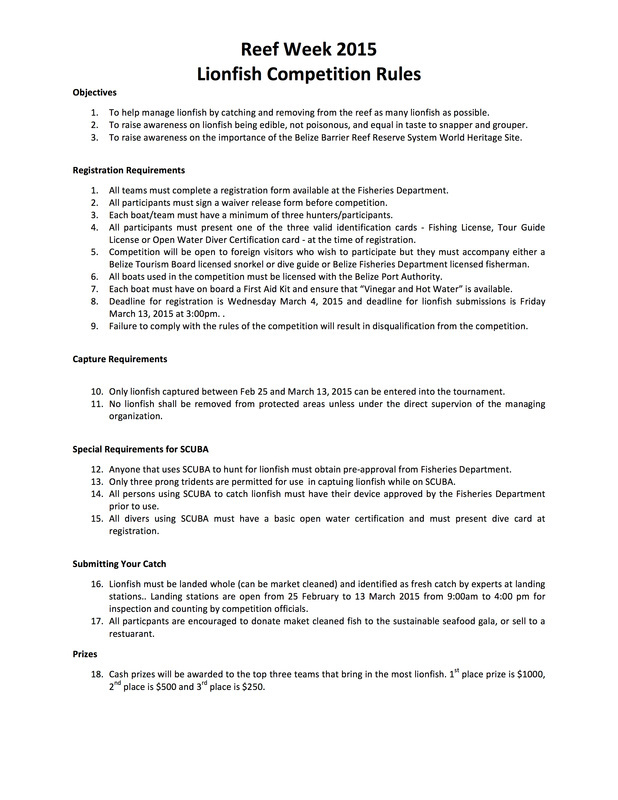 The Lionfish Competition Rules prepared by the Belize Fisheries Department summarize how visitors to Belize can participate in lionfish hunting/culling efforts. Collaborate with Fisheries Department and provide more lionfish samples from the reefs in Belize for another university graduate student studying invasive lionfish Texas Invasive Species Institute, Department of Biological Sciences, Sam Houston State University.